3 bedrooms & 2 1/2 baths. Bedroom (3) Includes 1 Queen with seating area with 2 chairs & table. 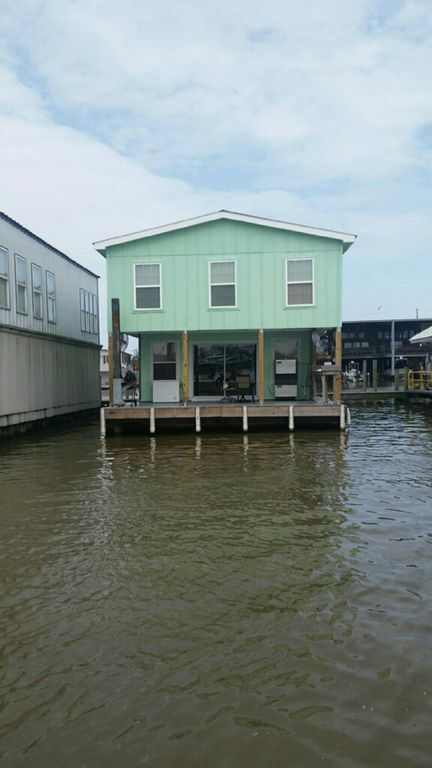 The houseboat is equipped with a full kitchen,washer & dryer, 400lb ice machine, fish cleaning table, Dish TV, BBQ grill. Also, there is a chest freezer on the porch for storing your bait or your catch. You are able to dock your boat on either the East or West side. Just bring your tackle and groceries and you are ready to go. The Dorado has all the comforts of home. Here, you will have 3 bedrooms and 2 1/2 baths. There are NO bunk beds. A recent guest said that " if you can't sleep, you can't fish"
This is only houseboat in the Venice marina that allows you to park you boat on either East or West side. You will not have to worry about another boat taking up your space or bumping into you. Stayed for 2 nights but wish it could have been this place was fantastic. The owner Doug went out of his way to make sure everything was perfect and even sent me a reminder of things people commonly forget and sure enough I had forgot to pack something. If there is a nicer place to stay in Venice I didn’t find it. Very clean and well maintained. Owner is responsive and this property worked great for our fishing trip. Possibly one of the best spots in Venice, LA! Property was clean and had all the amenities described. We came with 6 guys and everyone had their own bed. Bathrooms and kitchen were super clean. Ice machine was a huge plus too! Charter captain picked us up from the patio dock so it was super easy to get on the water and fish. We will be back to fish Venice this summer and next spring and this will be our go-to for lodging. Shout out to JF at MGFC for putting us on the swordfish!! First off Doug, the proprietor of this piece of property is probably one of the nicest people I have ever dealt with. He was there for the group on anything we needed. The house boat was great and more than comfortable for seven guys. It was very clean and and comfortable, not to mention the price was very inexpensive. One of the best parts was where the fishing boats we had chartered would pick us up right at the back deck which was so convenient that it’s hard to believe. Doug is a top rate guy and all of us that stayed there would recommend his place to anyone. Doug keep up the good work, see you again soon, Mark, and six others. Enjoyed our stay and Doug made sure we had everything we needed. Houseboat is comfortable, clean and well stocked. It provided plenty of space for 6 of us. Nothing needs changing, it is beyond a “houseboat” stay in a far away place. It has all the creatures of comfort and your staying on a houseboat in a far away place. The best of both worlds. Hot water and water pressure fantastic, refrigerater stove oven coffee maker all work like home. Ice marker full, heaters worked great, and for those who must have Satellite TV also worked great. Great cell service Yes. And the one great purk, it’s location. It is very close to the parking and the back deck where the grill is faces the only entry / exit of the marina so sitting there boat / people watching is a great way to relax when not on the water yourself. Check in time is 3pm and check out time is Noon. In the event of bad weather, I can refund your money or you can pick other days.